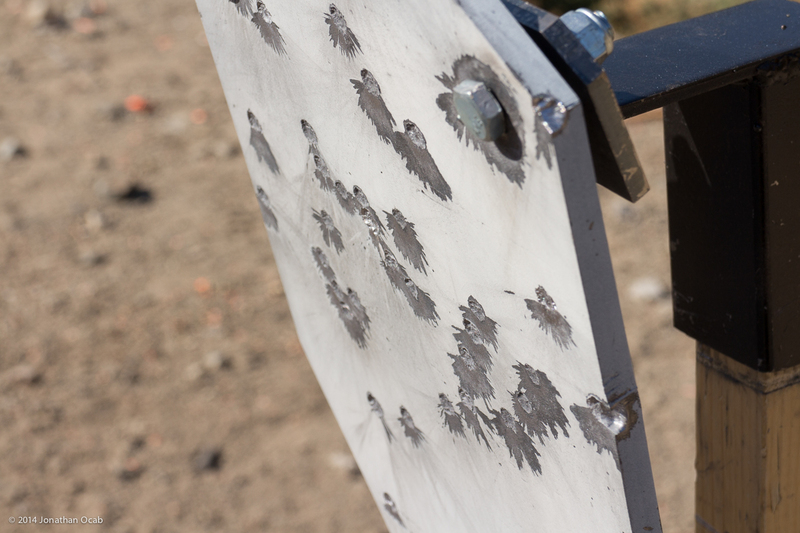 Now that I started to shoot more dynamic rifle / carbine drills at the range, I decided to buy some ‘inexpensive’ steel targets to shoot on at 50 yards. Note: 50 yards is under the generally accepted minimum safe distance for shooting rifle cartridges into steel. Most will argue that 100 yards is the minimum distance for rifle on steel, while some advocate 150 or even 200 yards as the minimum safe distance. 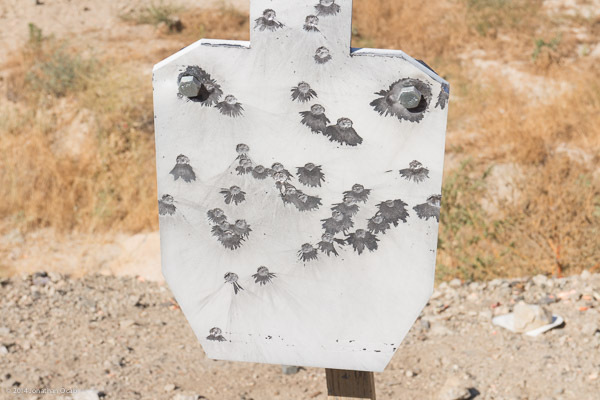 I have been using 66% IPSC AR500 steel targets by SoCal Targetworks for my pistol shooting, and I actually shot on them with rifle at 200 yards with minimal cratering. I took a risk and tested a few rounds on them at 50 yards and saw definite cratering, so I immediately stopped so I wouldn’t destroy those targets for my pistol use. 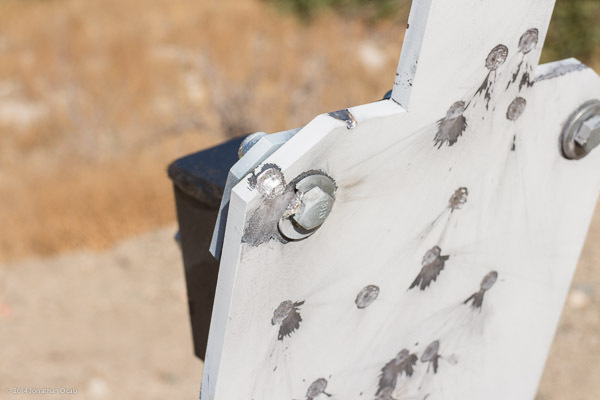 In order to test the feasibility of steel at 50 yards with rifle, I picked up a couple of 45% IPSC AR500 steel targets from SoCal Targetworks with the intent of shooting them at 50 yards with M193 / XM193 55gr FMJ 5.56 NATO ammunition out of my 16″ mid-length AR-15. I ordered the 45% IPSC targets because SoCal Targetworks had them for a decent price ($35 each), and if I destroyed these, I wouldn’t be too mad about it. In my write-up on the 16″ build, I noted that I chronographed the M193 ammo with a muzzle velocity of just under 3200 fps out of my specific gun. In terms of penetration, speed ‘kills’ and M193 is about as fast as it gets as far as 5.56 NATO ammo is concerned. 50 yards is below what is widely considered the minimum safe distance for shooting rifle cartridges on steel. Rifle cartridges on steel at short range will likely result in short a lifespan for steel targets. With regards to the first point, 200 yards is about the minimum safe distance for rifle on steel. Some will argue that 100 yards is safe. When I say safe, I refer to the amount of splash back and ricochets of bullets and bullet fragments as well as the preservation of the steel target. Saying this, why would I risk it at 50 yards? I am mitigating the effects of splash back and ricochets by a down angle of the target. I have a 20 degree down angle of the steel, which means that bullet splatter and fragmentation is deflected down. I am also taking a secondary mitigation by placing the targets with a lateral angle towards the left or right of the shooter (me). This is only a slight 5 degrees or so, but helps to decrease the likelihood of splatter directly towards the shooter. As far as preservation of the steel, I’m pretty much sacrificing the steel for the sake of rifle shooting at close range. All this said, I took the steel targets to the range on July 4th for some early Independence Day shooting and only 50 or so rounds was enough to put a significant beating on them. I expected the cratering that are seen in the photos below. But the edge damage that I put on them was a bit surprising. Of course, this can be mitigated by shooting tighter / centered, even in speed drills. I highly discourage shooting steel with rifle cartridges under 100 yards. If you decide to shoot steel in this manner, you should NOT reuse the steel for pistol shooting at immediate close range (10 to 25 yards). Pitted steel is pretty much useless at close range in that you will maximize bullet fragmentation and splatter, and will result in shooters being hit by fragmentation. 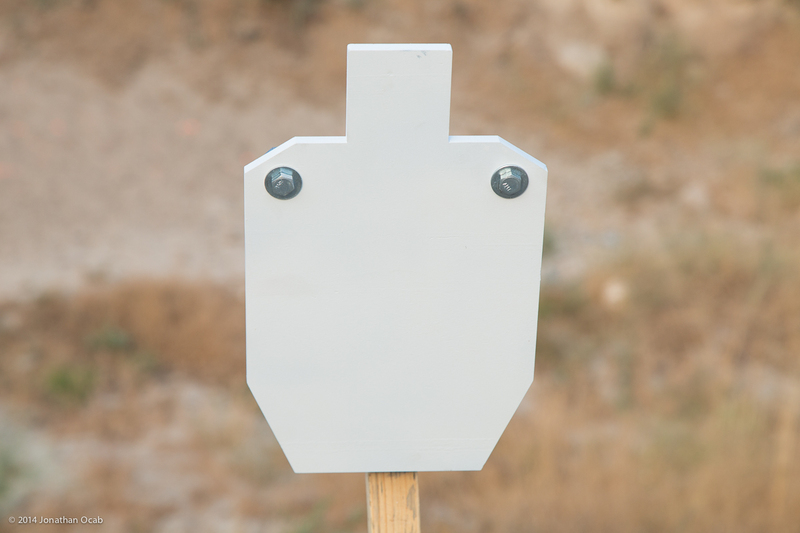 Shooting steel at 50 yards with rifle requires a lot of caution and mitigation procedures. Like I mentioned earlier, you absolutely must down angle the steel so that splatter is directed towards the ground. Also, angling the target to one side (away from the shooter) will decrease return fragmentation. If possible, place a barrier between the target and the shooter. Some instructors setting up steel for courses will often place wood barriers a couple feet tall a few yards in front of steel targets. This helps to block return splatter and fragmentation coming off the steel. ALWAYS WEAR EYE PROTECTION WHEN SHOOTING STEEL TARGETS. Eye protection is generally required by most shooting ranges, so this is a given, but never get lazy with eye protection when steel targets are involved. One last note that I should probably add is that these reduced IPSC targets are on a fairly rigid mount and are not free swinging. 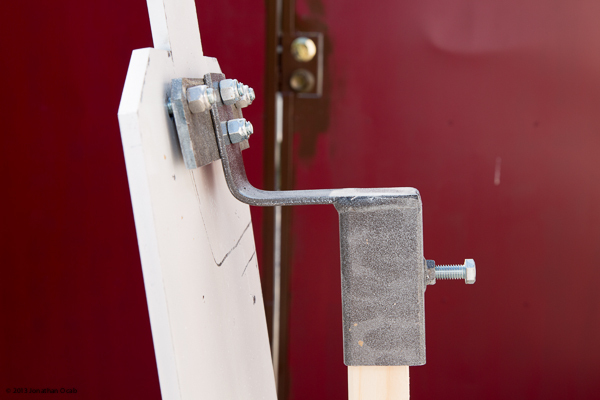 They are mounted on to a bracket which is in turn put onto a 2″x2″ that is put into a target stand. 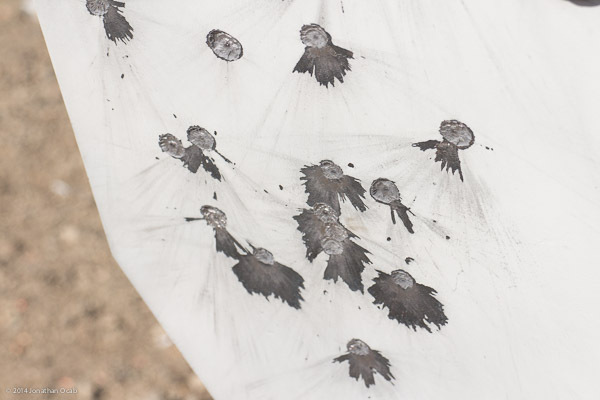 It’s quite possible that the pitting and cratering could be reduced if the target were allowed to swing in a manner that absorbs more energy into the target system as opposed to the steel target surface absorbing all of the impact on that specific pinpoint where the bullet hits. Of course, I like the bracket system like that shown above because I am able to create the downward angle of the target face to deflect splatter towards the ground.